Sounds ominous, doesn't it??? It's a fascinating phenomenon connecting the atmosphere and the sea, that meteorologists, seismologists, and oceanographers are only starting to understand. But truly no big deal this time around. A tsunami is a large wave that travels across a large body of water, usually caused by an earthquake or other seismic activity. You may remember the earthquake and tsunami that struck Japan in late 2012. We previously experienced a slightly more significant meteotsunami along the Jersey Shore following the derecho (long-duration wind event) on June 13, 2013. 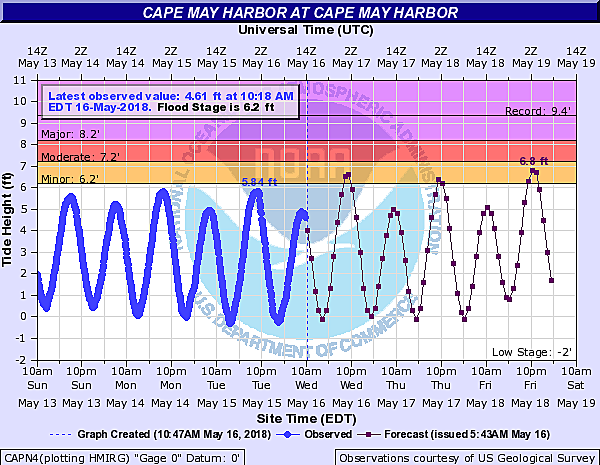 This time around, the initial meteotsunami alert called for several inches to up to a foot of extra tide water along the Jersey Shore. That's generally enough to spark minor flooding concerns along our tidal waterways, especially for the lowest-lying areas and roadways. I just did a tour of the tidal gauges along the Jersey Shore. And I'm happy to report all is well. For the vast majority of New Jerseyans, this tsunami alert is irrelevant (although very interesting!) Of course, given the uncertainty of currents and water levels, it might be a good idea to stay out of the ocean today if you can — whether as a swimmer or boater. Dan Zarrow is Chief Meteorologist, Seismologist, and Oceanographer for Townsquare Media New Jersey. When he's not researching fascinating natural phenomena, he's pumping out the latest forecast and realtime weather updates for New Jersey on Facebook and Twitter.